Here at the Playground hostel, we pride ourselves on our party atmosphere, where we will create some long-lasting memories that you leave you begging for more. Alongside our fully stocked bar, we've got all the bar/drinking games you could possibly want. Beer Pong: Got it! Flip-cup? Completed it mate! Kings cup? Of course! Drinking Jenga? You better believe it! If we don't have it, let us know and we'll do our best to make it happen! Aside from the parties, our bar/common area is a perfect spot for socializing during the day. 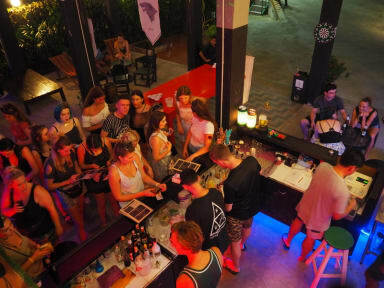 Whether you’re nursing your hangover, jumping straight into day drinking or just chilling out from exploring the craziness that is Bangkok this hostel is for you! Grande bella esperienza staff gentile , ostello pulito atmosfera simpatica. Hostel is conveniently located in Bangkok. Staff is awesome, super friendly and helpful. We had so much fun there at the bar, great atmosphere! The room was cozy and clean. Next time we will stay there again. L'ostello è molto carino e pulito. La sera è molto attivo: ci sono sempre serate organizzate e molta gente ci partecipa. Rapporto qualità prezzo è buona. La posizione è un pochino scomoda rispetto al centro ma in 40 minuti a piedi e 15 con il taxi si raggiunge comodamente qualsiasi punto centrale. Great Hostel! Staff is very friendly and helpful. There is an incredible atmosphere, good music during all the day, a beautiful common area where you can relax and stay with the other guests! Prices are very cheap and you can choose between rooms with fan or air con. I definitely recommend it and I’ll come back for sure! Siamo stati in questo ostello io e la mia ragazza per 2 notti e ci siamo trovati molto bene. Letti grandi e comodi, bagni in comune ma sempre molto puliti e Personale gentile e disponibile per qualsiasi cosa! È stato un bel soggiorno. Good organized, cool place, full of nice people...you will find mates until the morning and have fun. It offers nice trips at good prices too.